Leo Vegas was launched in 2012 with an ambitious aim of becoming the No.1 in mobile gaming. 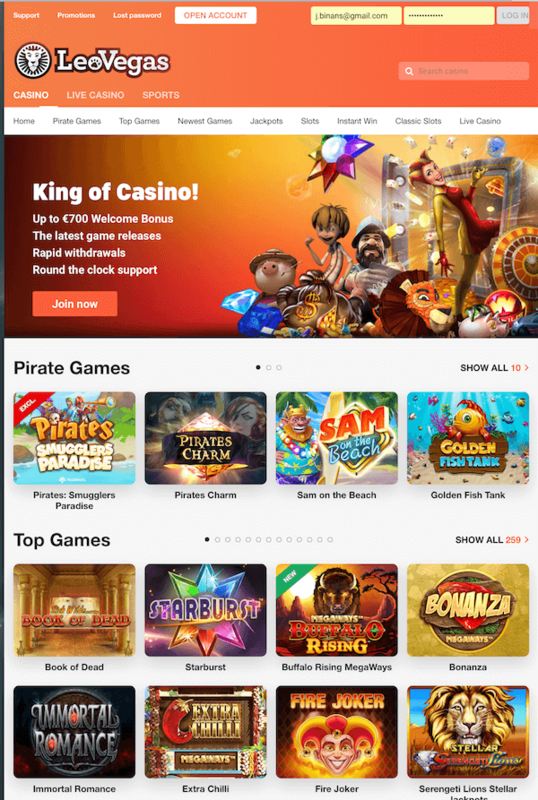 Thanks to their easy-to-use site website, cooperation with the biggest game providers, generous promotional offering, fast withdrawals and friendly 24/7 support, the Casino has quickly won hearts of UK players and recruited numerous fans in other parts of the world. Leo Vegas operates with multiple licenses, namely those issued by the UK Gambling Commission, the Malta Gaming Authority, the Danish Gambling Authority and the Irish Revenue Commissioners. The gaming site is operated by LeoVegas Gaming PLC which also manages Pink Casino (an online casino for ladies), 21.co.uk, Slot Boss, BetUK, Castle Jackpot, Crown Bingo, Slotto, BingoStars, Slot Mob, M Casino and UK Casino. Leo Vegas is a multi-provider casino using a proprietary platform to make the complete offering accessible via desktop computers and mobile devices. Top game developers have helped the team build „a slot catalogue worthy of a roar“, compile a collection of 60+ table games and provide an exquisite Live Casino which will make you feel as if placing bets at a physical table located in a classy brick-and-mortar gambling venue. An impressive list of providers includes NetEnt, Microgaming, NYX/SG, Play ‘n GO, Yggdrasil, iSoftBet, Quickspin, Big Time Gaming, Lightning Box, WMS, Blueprint Gaming, Barcrest, Pragmatic Play, Genesis, Bally, Core Gaming, Push Gaming, Realistic Games, Fuga Gaming and Inspired Gaming. Leo Vegas offers you to choose between Casino, Live Casino and Sports welcome offer. The first consists of a 100% bonus up to £100 and 20 free spins with each of the member’s initial four deposits. UK players will additionally receive 20 spins on the house even before they pay a single penny; all they need to do is open an account. A minimum deposit of £10 is required to be able to take advantage of this special deal. If you’re tempted, make sure not to fund your account with Skrill or Neteller as those deposits will not qualify. You should also know that only bets made with Bonus money contribute towards the wagering requirement of x35. Wagers made with Real money won’t count, and same goes for bets over £5. One should at the same time avoid minimal risk wagering (like betting on both Red and Black when playing Roulette) as the Casino might penalise you by confiscating the bonus and any winnings. Free spins worth £0.10 each can be used on Book of Dead and have a validity period of 7 days. Any resulting winnings have to be wagered 35 times before being withdrawn. Slots contribute 100% (with some exceptions), table games and video pokers only 10%, and bets on all other games count in full. Live Casino welcome offer doubles your first deposit of £10+ and awards a bonus of up to £250. Bonus needs to be wagered 70 times before it can be withdrawn along with the winnings. Once again, Skrill and Neteller deposits are not eligible. Table games, video poker and live games contribute 100%, while slots and all other games don’t count at all. Minimal risk wagering may result in bonuses and any subsequent winnings being removed. T&C Apply to bonuses and 18+ Only: New UK players only. 20 Free Spins on sign up. Deposit bonus: 100% up to £100 Bonus + 20 Bonus Spins, on each of your first 4 deposits. £10 min deposit (Skrill, Neteller excluded). £5 min. wager to activate Bonus Spins. All spins only valid on Book of Dead and expire after 7 days. 35x wagering on eligible games (£5 max stake) before Bonus, Free Spin or Bonus Spin winnings can be withdrawn. Eligibility restrictions apply. See Website for full T&C. Please play responsibly – begambleaware.org. With the number of video and classic slots available, as well as diversity of themes and features, Leo is doubtlessly able to please any slots enthusiast. Book Of Dead, Starburst, Immortal Romance, Bonanza and Rainbow Riches are some of those listed under „top games“ and usually found at any online casino powered by same developers. Same goes for juicy jackpots offered with progressive Mega Moolah, Major Millions, Mega Fortune and the likes. What sets Leo’s slots collection apart are exclusive titles such as Vegas Party, Royal Family and Pirates: Smugglers Paradise. Vegas Party is NetEnt’s slot offering a max prize of 270,000 coins. It plays with a unique reel replicating and synchronising feature which can result in triplet, quadruplet or quintuplet reels. Royal Family by Yggdrasil offers an opportunity to rub shoulders with nobility and launch free games in one of 3 ways, at the same time benefiting from multipliers, high-paying symbols turning into Wilds, or extra substitutes added as of the first spin. Pirates: Smugglers Paradise is another Yggdrasil title paying for creating cluster combos. When two or more are formed in the same spin, lower paying symbols will transform into highest value ones and non-winning icons disappear to free space for the next batch. Once the player triggers free games bonus round, they’ll be offered to pick between 3 Free Spin modes and either get 2 winning symbols added to each dropdown, have all low paying symbols removed, or keep multipliers accumulating instead of being reset at the end of each dropdown. Leo has enlisted the help of the best live gaming developers to be able to provide 24/7 access to more than 100 tables hosted by entertaining and professional dealers. Evolution Gaming, NetEnt and Authentic Gaming have provided an array of Live Roulette, Blackjack, Baccarat and Poker variants with a wide range of betting limits. One can enjoy boosted payouts in Lighting and Double Ball Roulette, play along patrons of Casino International, St Vincent and Foxwoods land-based establishments, and communicate with croupiers speaking Swedish, Danish, German and Spanish. Blackjack fans have a choice of joining standard 7-seat tables either by claiming a virtual chair or betting behind, or alternatively opt for one of the games capable of accepting an unlimited number of players simultaneously. Leo Vegas Chambre Separee is a private room filled with exclusive tables playing HD Evolution-powered live dealer games streamed from the developer’s studios in Latvia. This is where you’ll find LeoVegas Live Roulette, 3 LeoVegas Blackjack tables, Celebrity Party Blackjack, Dansk Celebrity Party Blackjack, and LeoVegas Sports Blackjack. Premium area of the same exclusive room hosts LeoVegas VIP Blackjack, Silent Blackjack and LeoVegas VIP Roulette. Since becoming the king of mobile gaming was Leo’s intention from the very beginning, it’s not surprising to see the team has developed native Apple and Android apps as an alternative to visiting the Casino via mobile browsers. Being aware of their highly positive track record, it’s also no wonder they have received multiple awards for their efforts. Leo Vegas is the winner of Best Native App at the EGR Operator Marketing and Innovation Awards 2017 and voted Mobile Casino Product of the Year at EGR Operator Awards 2018. Visit their mobile site and you’ll find about 500 slots and 50 table games, along with the same impressive Live Casino available to desktop players. The Casino accepts payments made in EUR, GBP, SEK, NZD, CAD, CHF, CZK, NOK, DKK and AUD. Registered players will be able to deposit £10 or more via credit/debit cards (Visa, MasterCard, Maestro), eWallets like Skrill and Neteller, Trustly or PaySafeCard. The operator commits to withdrawal processing time of 5 working days max but you’ll find that they normally complete the job within hours. If you’re lucky enough to generate profits, Leo will pay you a minimum of £10 per transaction and a monthly maximum which depends on your VIP status and ranges between £100,000 and £300,000. Regular players can count on 3 withdrawals per 30 days begin free of charge; additional ones will cost them £3 each. Unlimited number of free cash-outs is only available to members who have managed to obtain VIP level of 30 or higher. Leo Vegas is a complete package with not much missing. The Casino addresses different preferences both with the choice of games as well as three different welcome offers. Award-winning mobile experience is one of the best currently available, withdrawals fast enough, and direct assistance available any time one needs it via Live Chat, phone and email. The list of supported banking options is a bit shorter than we’d like and more modest than those featured by some of the competing brands. Same goes for the availability of ongoing promotional deals. Still, if you’re not dying to pay with Bitcoin and prefer to play with your own funds rather than deal with challenging wagering requirements, Leo Vegas will likely be able to provide a highly satisfactory online gaming experience.